France's Gilets Jaunes (Yellow Vests) protesters marched across the country for the 21st consecutive week on Saturday. They were 22,300 to march across France, according to government figures, the lowest turnout since the movement started in November last year. Thousands marched in French cities including Rouen, where figures of the movement had called to rally, Bordeaux, Lille, Nice, Montpellier, Forbach, Nantes, St Malo or Mulhouse. The turnout in Paris, at the authorised march from Place de la Republique to La Defense financial district, was 3,100 by noon, against about 1,800 last week. The Paris march to La Defense was organised to demand "social, fiscal and ecological justice". There were 28 arrests in Paris and a few clashes with police in Rouen. The French authorities had issued protest bans for the Champs-Elysees and areas near the Elysee Palace and the National Assembly in Paris. The protests were relatively quiet compared to previous marches, which should come as a relief for president Emmanuel Macron. His government is expected to release on Monday the outline the findings of the "Great National Debate", a three-months-long dialogue with the French to find out about their concerns, which ended officially on Friday. The debate was launched to appease the Gilets Jaunes and try to develop policies that would convince the movement to stop. 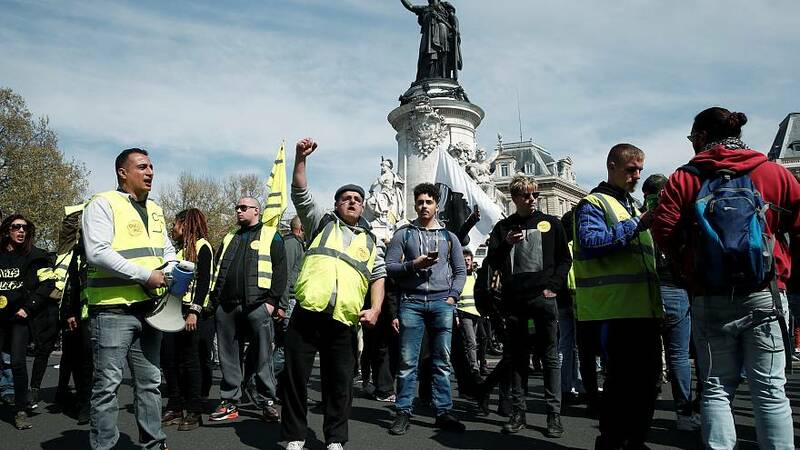 Yet five months after it started as a protest against fuel taxes on 17 November, although the Gilets Jaunes movement has seen its numbers fluctuate, the protesters still show up week after week on the street. Those who are still protesting show no intention to stop. "What would make me stop protesting would be the sacking of the Interior minister, Christophe Castaner, because of the police violence", a protester on the Paris march called Catherine told the AFP on Saturday. On Friday night, Gilets Jaunes organised a surprise protest in Le Touquet, a coastal town in northern France, where Macron owns a villa. About a hundred rallied near the president's house and some chanted: "Emmanuel Macron, we're here, we're coming to get you", a reference to Macron's boastful comment from last summer, when he dared his critics to "Come and get him".